Cold weather can’t stop a backyard brawl, only temporarily delay it. Originally scheduled for Saturday, Jan. 6, Pitt swimming’s meet against West Virginia was delayed due to frigid temperatures in the WVU Natatorium. In the rescheduled meet Thursday, the women’s team dominated while the men lost to the Mountaineers. Winning 193-107, the women’s team placed first in twelve events, including nine individual races, two diving events and one team relay race. Junior Rachel Brown was key in propelling the women’s team forward, adding three of the Panthers wins. Brown won the 50-yard freestyle, 100-yard freestyle and 200-yard freestyle with times of 23.70, 51.93 and 1:51.50, respectively. Sophomore Valerie Daigneault continued to dominate for the Panthers, also winning three individual events. Daigneault took first in the 100-yard backstroke, 200-yard backstroke and 200-yard individual medley with blazing times of 55.71, 1:58.28 and 2:03.04. Ace diver senior Meme Sharp added two more first place finishes in the 1-meter and 3-meter dives. She put up scores of 319.87 and 306.06. Overall, the women’s team saw five different swimmers and divers win 11 different individual events. The men’s team found less success, losing 187-113. The Panthers managed a first place finish in five different events including the 200-yard freestyle, 200-yard breaststroke, 200-yard individual medley, 500-yard freestyle and 1,000-yard freestyle. Sophomore Samy Helmbacher was the highlight for the men, winning three events. Helmbacher outraced the Mountaineers in the 200-yard freestyle, 200-yard breaststroke and 200-yard individual medley, posting times of 1:39.38, 2:03.02 and 1:48.40, respectively. 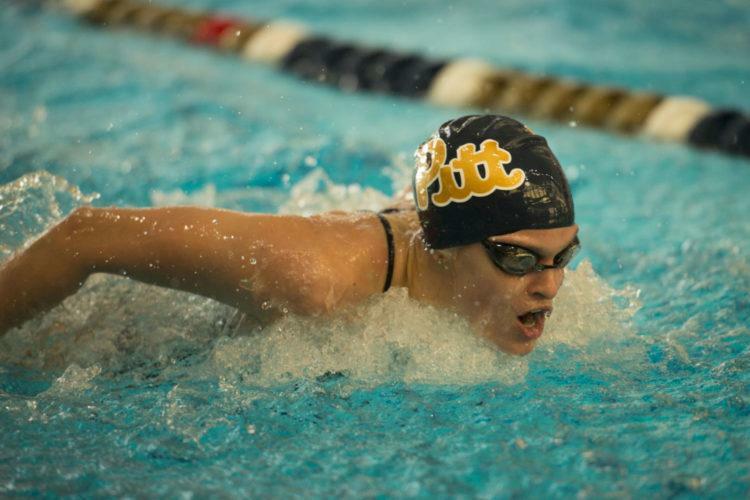 The Pitt women’s team moved to a record of 9-2, while the men’s team dropped to 5-3. The Panthers will return to Trees Pool for a meet in home waters against Denison on Friday at 4 p.m.